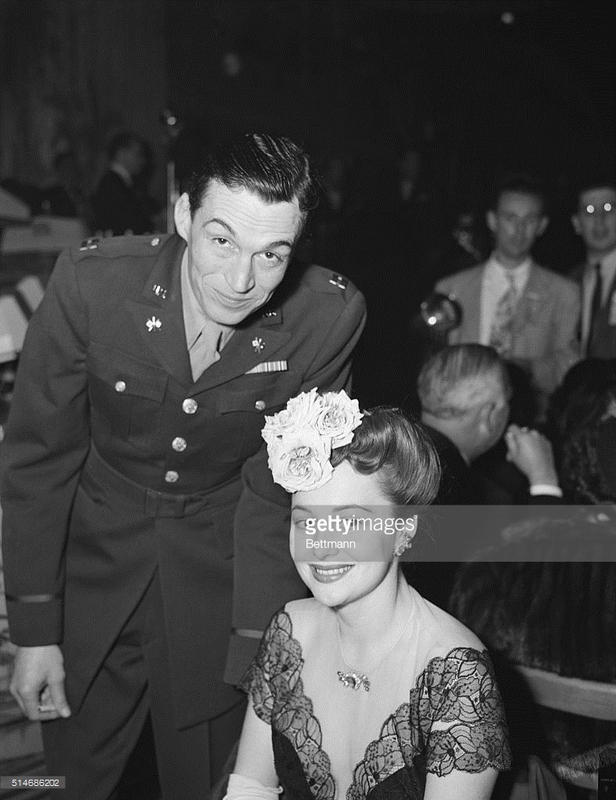 In 1942, John Huston received a mysterious letter containing “names of military personnel and various American Army posts. I puzzled over it briefly and dropped it into the wastebasket. Later I discovered that this was the Army’s way of sending orders.” He was then a new director at Warner Brothers, who’d just finished his first solo work The Maltese Falcon. “I had Bogie tied to a chair, and installed about three times as many Japanese soldiers as were needed to keep him prisoner…. I shot the scene, then called Jack Warner and said, “Jack, I’m on my way. I’m in the Army. Bogie will know how to get out.” As Major John Huston, Huston went on to make a trilogy for the Army, most of it controversial. And his first mission after the war, it seemed, was fighting censorship. In April 1946, the two young Army men walking into the museum stand out. Nearly a year after the end of the last war, their pale-brown uniforms are crisp, as ironed as the armbands marked MP (for Military Police). They walk past groups of schoolchildren, quiet academics, women young and old showing off the season’s new hats; for most, even for a weekday, a trip to New York’s Museum of Modern Art is pretty special. The officers head straight to the INFORMATION desk, which gleams as much as the marble floors in the seven-year-old building. Directed upstairs, they move swiftly to the second-floor screening room. They’re looking for the Museum’s copy of the new film by John Huston, which is on the schedule for the museum’s Festival of Documentary Film. In that second-floor screening room a small crowd squeezes into folding chairs. This is actually an informal months-early preview screening, includes journalists like critic Archer Winston of the New York Post and The Nation’s James Agee. They’ve come because the director, who made this film for the Army Signal Corps, is also a giant of the cinema since long before he entered the Army. Ignoring them, the MP’s walk directly to the back, speaking quietly to the projectionist. When they leave, they’re carrying all four reels of the film, before anyone has seen a frame of it. Later that day, curator Iris Barry tells the public that the museum is pulling a number of Army films, due to “copyright restrictions (which) confine their showing to military personnel only.”1 ( In addition to Huston’s film, they insist on all the footage from what was scheduled to precede it, Army and Navy Screen Magazine.) That night, James Agee writes a blistering response in The Nation, reporting that “a beautiful, terrible, valuable film by John Huston” had just been censored by the Army. “I don’t know what is necessary to reverse this disgraceful decision,” Agee closes, “but if dynamite is required, then dynamite is indicated.”2 Unable to do that, MOMA’s Barry does the next best thing: she replaces Huston’s film with another of his Army films, San Pietro – which had almost been also suppressed, accused of being “too anti-war.” Huston had growled then that people should “take me out and shoot me” if he ever made a pro-war film. Huston wasn’t alone: about half a million troops came home as psychiatric casualties. Hoping to persuade a nervous public that the war hadn’t destroyed their sons, the War Department sent him to a Veterans Administration psychiatric hospital in Brentwood, Long Island. Huston’s team shot thousands of feet of film, as he followed a dozen young men who entered the hospital paralyzed, or lind, or amnesiac. The process, he writes, was “almost like a religious experience.” The resulting film is earnest, a little hokey by today’s standards. Young men learn to call their illnesses “psycho-neurotic anxiety disorders.” Doctors assure them, and the camera, that “we’re conducting an education campaign” to erase any stigma. But that campaign did not include the film Huston had titled Let There Be Light. “They wanted to maintain the ‘warrior’ myth,which said that our American soldiers went to war and came back all the stronger for the experience.” The truth was probably closer to what Huston’s friend Ernest Hemingway had written in 1929: The world breaks everyone and afterward many are strong at the broken places. Despite (or perhaps because of) the Army’s suppression of his work, Huston soon had a new mission: to fight the burgeoning McCarthyism threatening his industry. That included the group’s filmmakers. John Huston turned the Maxwell Anderson project Key Largo into a troubled veteran’s story. “We weren’t making all the sacrifice of human effort and lives.. .to return to the kind of a world we had after the last world war,” army officer Humphrey Bogart tells a gangster, adding that his war was about “fighting to cleanse the world of ancient evils. Ancient ills.”1 Huston was trying, like Bogart’s character, tried not to give in to cynicism and fear. That wasn’t easy: 1947 was full of both. While Huston was turning a Hollywood sound stage into Key Largo’s Florida, a “Loyalty Program” began in Washington, with government-mandated “loyalty oaths” and FBI investigation of anyone suspected of Communist ties. And the House Un-American Activities Committee (HUAC), including a California freshman named Richard Nixon, had decided to investigate Hollywood. That summer Ayn Rand and Gary Cooper testified at HUAC hearingss about pro-Communist themes in movies like Robert Benchley’s “Song of Russia.” And back in Hollywood, gossip queen Hedda Hopper took up the cause of forcing every studio to require such oaths of their writers and stars. Huston’s answer, along with Signal Corps peer William Wyler, was the Committee for the First Amendment, whose members included Humphrey Bogart, Albert Einstein and Lewis Milestone, who’d followed his Signal Corps tour by making All Quiet on the Western Front. Wyler told reporters that the “current climate” would have precluded his 1946 film The Best Years of Our Lives, whose soldier-protagonists come home with shattered limbs, marriages and psyches (one, played by Dana Andrews, screams in his sleep every night). At home, that meant even less tolerance for free expression, especially when it had anything at all to do with the military. “A sickness permeated the country,” John Huston writes. “Nobody came to the defense of people being persecuted for personal beliefs. ” The “loyalty oaths” terror was reaching its climax in mid-1950, especially in Hollywood.Huston organized Directors Guild members to adopt a stance against such a requirement. He told Cecil DeMille that his faction were Signal Corps peers, and “were in uniform when you were wrapping yourself in the flag.” Then he went back to working on his last film for Warner Brothers, The Red Badge of Courage. But by mid-1950, Hollywood was busy drumming up support for the new war. It had filled movie screens with anti-Communist movies produced at White House request : I Married a Communist (1950), and I Was a Communist for the FBI (1951) to name a few. After previews highlighted Red Badge’s unorthodox form (and lack of a leading lady), Warner Brothers ordered a wholesale restructuringr: Out went the Tattered Soldier and veterans scenes; battle scenes were recut and compressed to form a story of triumph and victory. By then. Huston was in Africa shooting The African Queen, and he refused to see the new version afterward. All this was duly recorded by the FBI, which would call Huston in for a meeting the following year to ask about “misguided liberals” like Albert Einstein and ‘Commies’ like Charlie Chaplin, who’d been barred from re-entry to the United States the same year. By then, the Hollywood blacklist was in full effect, Senator McCarthy had been re-elected, and resistance to the Korean war seemed almost inconceivable. A few years later, Huston decamped to Ireland, from which he’d ride out the Cold War while making shot-in-Europe movies such as Moulin Rouge. When he was home, remembers his then-tiny daughter Angelica, “The only movies we watched were the war documentaries – San Pietro, Let there be Light…..”i) Unlike World War II peers such as William Kunstler and Philip Berrigan. Huston was done with activism, and his war stories were ever after pretty coded. Does he belong in this book? Or just as an accompanying story from history?